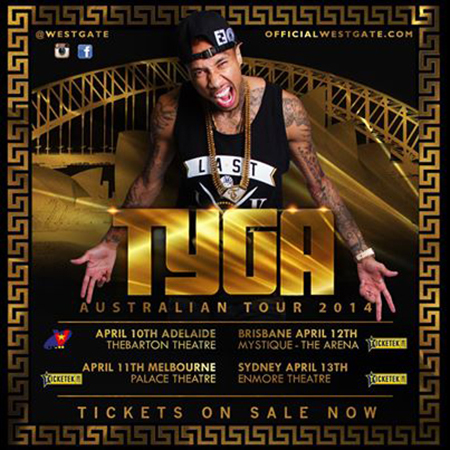 After blowing away Australian audiences in 2012 supporting YMCMB label mate Nicki Minaj, and selling out two of his own solo shows, Westgate Entertainment is excited to announce the return of Tyga to Australian shores in April 2014. The 24 year old West Coast rapper has had a huge year with the release of his third album, and one of the most anticipated releases of 2013 “Hotel California” which debuted #7 and featured the singles “Dope”, “Molly”, “For the Road” and “Show You”. This was the follow up to his critically acclaimed album “Careless World: Rise of the Last King” which debuted at #1 and featured the massive hit singles “Rack City” and “Faded” which both went platinum. Aside from his massive solo success and series of hyped mixtapes, Tyga is well known for his standout performances on the 2009 release of “We Are Young Money” album, most notably “Bedrock” and “Roger That”, plus Chris Brown’s #1 hit “Deuces”. Tyga has just released the fourth installment of his Well Done mixtape series that features appearances from Lil Wayne, Meek Mill and Fabolous and has been working on his new album entitled “The Gold Album: 18th Dynasty” set for release in 2014. Outside of music, Tyga has spent 2013 getting ready to launch his first flagship store in Los Angeles for his clothing line Last Kings, aiming to open in 2014. Don’t miss hip-hop superstar Tyga live in 2014!